Gregory Oakes has announced that he is seeking a second term as Oswego County District Attorney. Oakes, who has served as a prosecutor in the county since 2001, was first elected District Attorney in 2011. Since taking office, District Attorney Oakes has enhanced the prosecution of felony cases while working with the courts to move those cases more efficiently. ARISE revved up its Ride for Ramps program in Saturday. In honor of the 25th year of the ADA proclamation, members of ARISE and a slew of volunteers hosted a fundraiser with assistance from Lighthouse Lanes and Oswego Speedway. 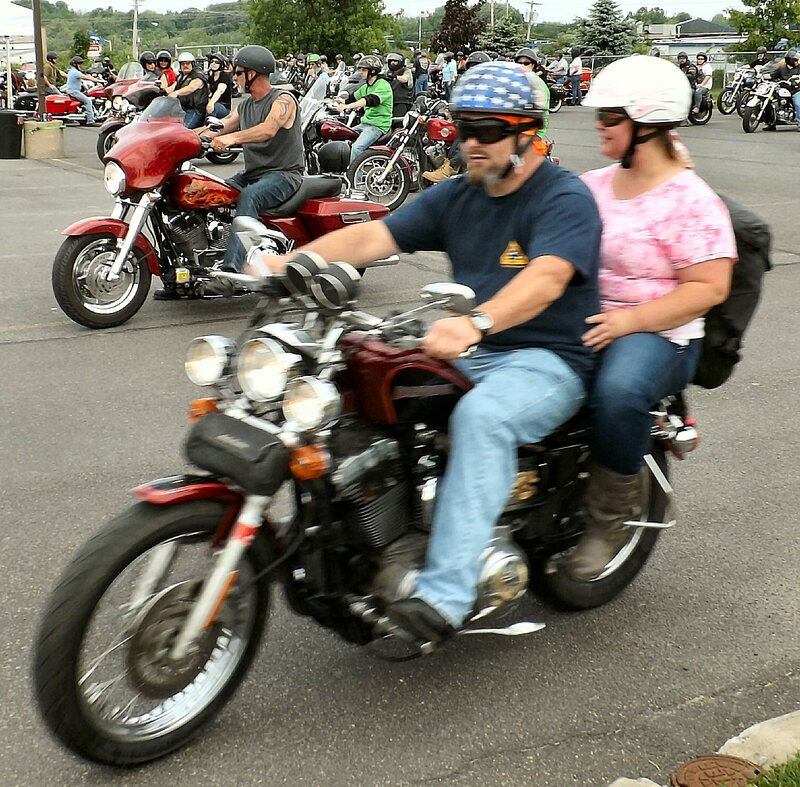 More than 100 motorcycle enthusiasts joined in to help raise funds for the ramps program. Each Month the Fulton Noon Rotary Club invites two students to lunch. The students discuss their high school career and in turn they learn about service to their community from the Rotarians. The production is part of FCT’s 25th anniversary season and its first onstage at The CNY Arts Center, located at Cayuga Community College’s Fulton Campus, 11 River Glen Plaza, just off of Route 481 North. The Oswego Elks Lodge is helping veterans who have served our country by transporting them to the Syracuse Veterans’ Hospital and to various doctor appointments. Part-time SUNY Canton students are being recognized for their outstanding achievement during the spring 2015 semesters Part-Time honors are awarded to students who earned at least a 3.25 GPA in 6 to 11 credits of coursework. In conjunction with the New York State “Path Through History” weekend, the town of Volney History Center will host “Scrapbook Corner” at the town hall on County Route 6, Volney Center. The scrapbooks will be available for genealogy and general reading 9 a.m. to 1 p.m. on June 20. The global tobacco epidemic is killing 6 million people every year; but leaders and efforts in Central New York are reducing smoking rates and protecting kids from tobacco marketing. To celebrate these successes, Tobacco Free CNY will be recognizing local champions to celebrate World No Tobacco Day. Brad Bird’s Tomorrowland: come for the sequence of George Clooney rocketing out of his house in a bathtub, stay to see how Disney works out a little girl robot love conundrum. Let me first say I did not realize Tomorrowland was being marketed as a children’s film. With George Clooney being one of the film’s stars, the other being Britt Robertson, an actor who attracts a slightly older group, I expected an entirely different film and one that certainly would not get children flocking to theaters to see it in droves. Sunil Ram envisions a stronger, healthier Oswego County, and says open and accountable government is the way to achieve it. Ram, who moved to Oswego when he was six years old, announced his candidacy for the county legislature’s 20th District, representing much of the town of Oswego.